Different opinions among historians about the name of the architect who designed it, Bramante or Francesco da Sangallo, the building was initially commissioned by Cardinal Francesco Alidosi at the beginning of 16th century, with the intent to emphasize the power of his family; then it was continued by Cesare and Rizzardo Alidosi and completed in 1542. The initial project was the construction of a castle-fortress, with four bastions that enclosed a large courtyard with twenty-four columns. A large moat surrounded the building and a bridge with three arches allowed to get in. Inside, a beautiful garden was called the Garden of Earthly Delights; in the basement, in addition to the wineries, there were two prisons for men and one for women. The Fortress, however, remained unfinished due to lack of funds. True jewel of the Renaissance architecture, the Cortiletto delle Fontane (Fountains Courtyard), in the southern part of the castle, has four beautiful fountains, several columns and eight niches which contented the busts of the most powerful representatives of Alidosi family. 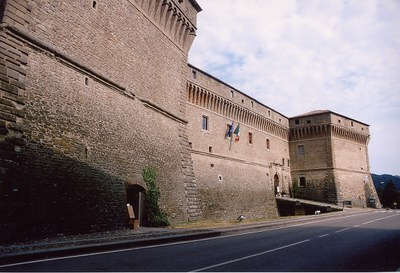 The Castle has been completely restored and is now the town hall; you also find a public library, the War museum-Gothic Line, the museum of the Chestnut and the Animal Tower, dedicated to the wildlife of Santerno Valley.